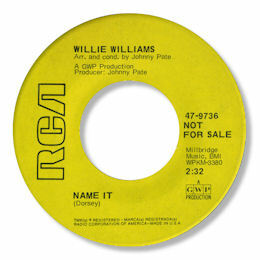 Chicago singer Williams released a handful of fine 45s in the later 60s. All of them were impeccably sung with some finely phrased and hoarsely toned vocals from the man. His early Gamma 45 was quite interesting. The broken rhythm of "Stop (You're Playing With My Heart)" although in the end less that successful artistically has its moments along the way. Note the name of "D Mancha" here - could this be Detroit's Don Mancha? But better was to come. He recorded several session for producer/arranger Johnny Pate who leased the results out to major labels. What distinguished With All Of My Soul and It Doesn't Pay from the others was the quality of the material. The former is a lovley melodic beat ballad with some interesting stop-go features, while the latter is a more orthodox deep soul piece of considerable force and maturity. Wiliams’ performance on the latter number is the best I’ve ever heard from him – superb horn charts too. 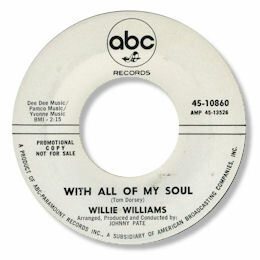 The flip of his first ABC release “Have You Ever Been Played For A Fool” is a Northern favourite, and although the sledgehammer beat is pretty irritating, Williams’ still sings up a storm. And despite the fact the the top side of the RCA single is a ballad, I prefer "Name It" with its slightly bluesy overtones and forceful horn section - another quality Willie vocal too. 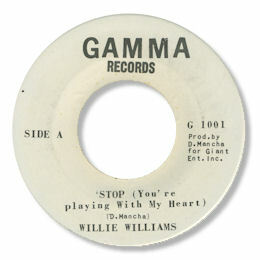 Sadly Williams' second Gamma 45 is pretty poor funk and although the Lakeside 45 is far better than it's title would suggest its really no more than average uptempo fare. Note ~ The blues drummer/singer on Supreme Blues (also from the Windy City confusingly) would appear to be a different artist altogether.